Why choose a gold wedding band? Everybody knows how precious gold is. Its qualities make it ideal for the jewelry trade, and it is also indispensible in industries as diverse as video technology, lasers, medicine & for spacecraft. Gold's many uses stem from its incredible malleability & ductility, meaning it can be shaped and stretched easily; and because it is resistant to chemical changes so it doesn't tarnish as easily as some other metals. Of course, the color as well as the physical properties means gold has been used for decoration throughout history and amongst many cultures. If you want a traditional wedding ring that is resistant to tarnishing, then gold is the choice for you. too soft to be worn as jewelry"
Origin of the name: The scientific name for gold is Aurum, and its chemical symbol is Au - from Aurora, which means dawn. History of gold: The first suggestion of gold being used for decoration was in Eastern Europe in 4000BC. In 1500BC, gold was used for trade for the first time by the Ancient Egyptians, and was first legalized as money a thousand years later in China. Between then and now, gold has been linked to many historical events and discoveries. Discoveries of new sources of gold in North America caused several infamous gold rushes during the 19th century, which hastened the colonization of the American West. Scientific developments in France in 1927 lead to the discovery that gold can aid recovery from rheumatoid arthritis. What is in our gold rings? Gold in its pure form is too soft to be worn as jewelry, as it would not withstand the everyday stresses that jewelry is exposed to. Instead it is mixed with other metals such as e.g. copper, zinc, silver or cobalt, to make a stronger alloy. A pleasant consequence of alloying gold with other metals is that it the end result is often a different color - so white and rose golds are now cherished in their own right. 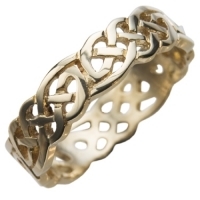 Click here for more information on white gold rings and rose gold rings. The carat system: The carat system is used by the jewelry trade to indicate the proportion of gold in an alloy, and therefore makes implications as to the quality of a ring. Kodega sell rings of 14, 18 and 22 carat. 22ct yellow gold is often thought of as 'pure gold' - it is extremely rare to get jewelry any purer than this as it would not be practical for the purpose. As 22ct gold has only a small proportion of other metals, you might find the ring is slightly softer than other carats. If you want a higher-value ring with a high proportion of gold in the alloy, then 22ct would be the way to go. 14ct yellow gold is the lowest that can be termed gold in the US. 14ct gold is 58.5% pure gold, with other metals making up the other 41.5%. People often prefer to have a higher percentage of gold than this, as it makes the metal more precious, but 14ct is favored by some as the high proportion of other metals makes it more hard-wearing. If you want a more long-lasting ring, and don't mind it being less 'pure', then 14ct is the choice for you. 18ct yellow gold is often used as a happy medium between the pleasant color and status of 22ct, and the durability of 14ct. 18ct gold will wear down, but over a longer period of time.